Here we offer a mix of 10 orchids as a taster of the island's riches starting, below and right, with two that botanists from the UK will know. This is a very pretty, tall, slim orchid, which flowers from the end of March to the end of April. It has a wide colour variation ranging from pure white to dark magenta. 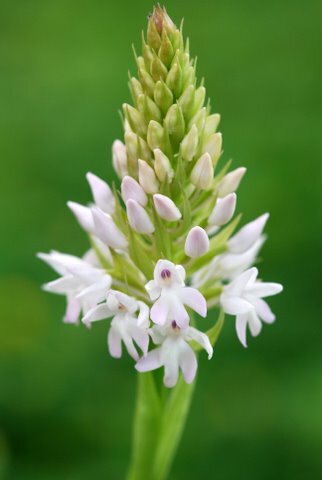 The triangular arrangement of the flower spike gives this orchid its name. It can be found on basic subsoil, in phryganae and in open meadows. This very widespread orchid can be seen from the beginning of February until the end of April and is thought to bloom in two successive waves. Although, at first glance, fairly inconspicuous, it can be found in a variety of wonderful pastel and vibrant shades, ranging from pearly grey to deep cerise. 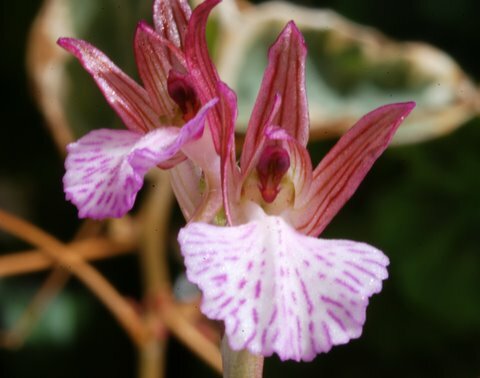 It is the most common orchid to be found on Crete, although it is rare elsewhere in Greece. 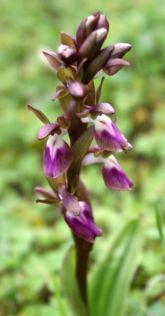 NB: All of Crete’s many orchids are protected by International Regulations, as are their habitats and it is strictly forbidden to pick, uproot or otherwise destroy any plants. The penalty can be a huge fine or a prison term. More orchids on Honeyguide's picture gallery of orchids on Crete. Orchids are among the most popular of flowers for visiting botanists with around 67 species on Crete. Sometimes they are large and showy, such as Italian man orchid Orchis italica, sometimes small and easy to overlook such as many of the Ophrys orchids (bee orchid group). The taxonomy - which species or subspecies is called what - can be complex and continues to be debated. 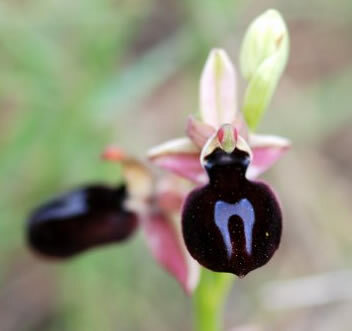 In praise of Ophrys: Thomas Sampliner writes about his favourite orchids — click here. This is one of the later flowering orchids, which can be found blooming in April. 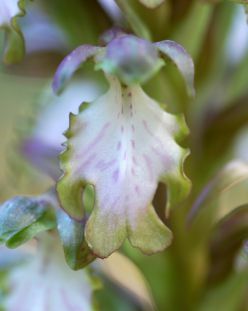 It is the only species of the orchis family that does not have a spur. It prefers meadowy phryganae, but is also seen in open pine woodlands, as long as the subsoil is of chalk. There are three confirmed species of O. cretica on Crete. Ophrys cretica ssp. ariadnae is the only one believed to not be endemic (native). Identification can be quite tricky as the differences between the subspecies are fairly small and the added problem of hybridization makes matters worse for the non-botanist. Ophrys cretica can be found in phryganae, meadows, and in open olive groves. It has quite a long flowering period, but is best seen from the middle of February to the beginning of April. 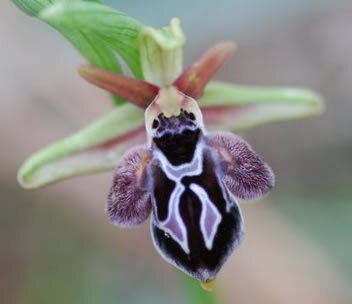 According to Dr Horst Kretzschmar and others, this ophrys has not been found on Crete. However, this specimen was photographed a couple of years ago just outside Elounda. I was immediately drawn to it because of its lack of side lobes, which made it stand out from other ophrys in the meadow. It is quite commonly found on Rhodes and so seed may easily have been carried to the north coast of Crete. Unfortunately, although I have been back to the site several times, I have not found it again and the area is now being heavily developed. The lip is round and distinguished by un-formed side lobes. 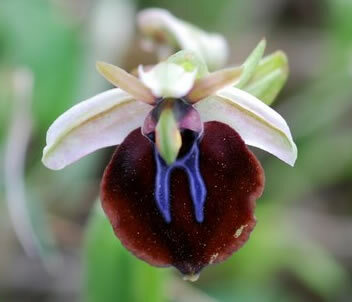 This ophrys has very large flowers and can be found in April in scattered areas of Crete. This endemic ophrys is probably more widespread than presently believed and should be looked for in meadows, grassy phyrganae, meadow slopes and terraces. This is a tall, many flowered plant, which can often be found in groups. The small flowers have a rounded lip and slight lateral humps. It blooms between the middle of March and the middle of April and can be found in phryganae, old pine forests and on meadow slopes. It is a very delicate ophrys. The orchid flowers in sequence from the lower flowers to the top. The height of the plant can vary from 20 – 40 cms and can be found on slightly acidic meadows. It is often found blooming with Orchis sitiaca. The flowering period is from the beginning of April to the middle of May. It is more common in central Crete than in the far east or west. Of the two species of O. papilionacea found on Crete, The Heroic Butterfly Orchid is the first to bloom - as early as February in some years. It is a much stockier and more sturdy subspecies than the endemic O. papillionacea ssp alibertis, which begins to flower in mid-April. One of the most beautiful of orchids, a pure white form can sometimes be discovered. It grows in phryganae, dry meadows, in open grassy places, and in sparse pine woodlands. 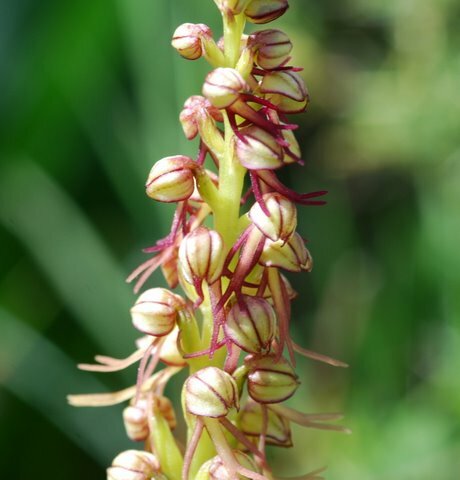 Unfortunately, this orchid is often picked in spring for its tall spires of flowers with their delightful scent. Although protected, as are all Cretan orchids, this practice has been going on for centuries and will take many years to die out. In the village of Kritsa, as elsewhere, buckets of these blooms can be found for sale during April. Fortunately, B. robertiana is common all over the island – at least for the moment.